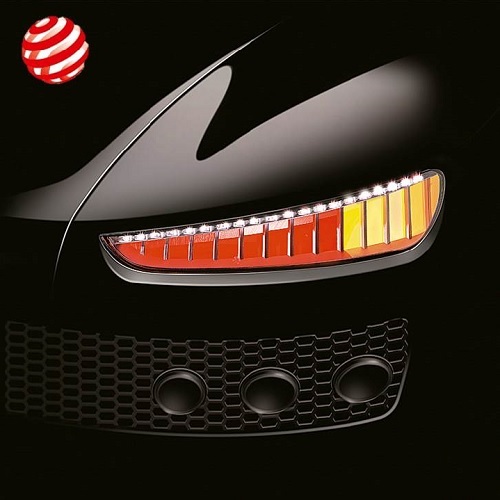 Automotive Lighting, the Magneti Marelli division devoted to automotive lighting received two “Red Dot Award 2015”, one of the most prestigious international awards in design and industry. First award was recognised for the Full LED smart headlamp developed together with Audi for the Audi TT3, MY 2015 - "Red Dot Best of the Best" award - for the high quality of the design and the innovative project. The second award was recognised for an OLED (organic led) technology rear light prototype - "Red Dot" award - for the design quality. These are two absolute level awards that provide further evidence of the company's technological excellence within the most advanced solutions for automotive lighting. The jury, composed of experts from 25 countries, awarded the "Red Dot Best of the Best" and "Red Dot" prizes to the two Automotive Lighting products, motivating them with the uncompromising competency and considerable courage that characterise both solutions in the context of the best technologies on the market. The smart full-LED headlamp, developed for the Audi TT3, MY 2015, awarded the "Red Dot Best of the Best" prize, is characterised by the glare-free high-beam light (Matrix) composed of 12 LEDs individually controlled by a camera positioned behind the windscreen. Thanks to this and to the electronic control unit, the LEDs switch on and off automatically facing opposing or proceeding traffic. It is further characterised by a day time running light consisting of three-dimensional elements and thanks to three dedicated lenses, the LEDs provide a unique design. This is a smart lighting system that is able to direct the light beam with millimetric precision depending on requirements, allowing an exponential increase of visibility on the road and safety, both for the driver and for other cars. The prototype for the rear light with OLED technology was awarded the "Red Dot" prize for design quality. The rear light, created with OLED-elements provided by Philips, contains 9 red and 5 amber OLEDs which give a homogeneous appearance regardless of perspective. For the reverse function, a number of classic LED-chips were included. Even when the tail light is off, the OLED elements are extremely elegant and appear to be a silvery mirror. The "Red Dot Award: Product Design" is one of the most coveted product design awards at an international level and was established in 1955. In 2015 designers and companies from 56 countries presented around 4928 innovative products at the competition for the "Red Dot Award: Product Design". The official award ceremony will take place this coming 29th June at Aalto-Theater in Essen, Germany. Further to this two prestigious awards, recently Magneti Marelli Automotive Lighting marked another fundamental stage in its history of technological records: in fact, at the Geneva Motorshow in early March, the new Audi R8 was showcased, being the first series production car equipped with a full LED headlamp with a LASER high-beam module, developed by Automotive Lighting and Audi. In the past Automotive Lighting has already been recognised on two occasions by the jury of the "Red Dot Design Award". In 2008 it received the Red Dot Design Award for the first full-LED headlight for cars in the world, built for the Audi R8, and in 2011 the Red Dot Award: Product Design for the first smart full-LED headlamp with Adaptive lighting, developed for the Mercedes-Benz CLS. In 2011, Magneti Marelli Automotive Lighting also received two other important international awards: the "Professor Ferdinand Porsche" award for the development and application of new LED lighting technology in the automotive field and the Daimler "Special Award Innovation" award for the development of the first smart full-LED headlamp with adaptive lighting in the world created for the new Mercedes-Benz CLS.